It is autumn, and Ms. Jones and Ms. Hernández are engaged in an investigation of trees in the park next to their school. The park has several different kinds of trees. The children in the classroom have been picking up leaves, nuts, and seed pods that have fallen from the trees. The children often show their teachers the items they have found on the playground. Ms. Jones and Ms. Hernández realize that the children’s interest in these items is an opportunity to meet some IELDS science benchmarks. They decide to bring baskets out during outdoor play to encourage children to create nature collections. Three children, Raúl, Luis, and Esther, are dual language learners whose home language is Spanish. They started school with little understanding of English. Ms. Jones’ TA, Ms. Hernández, is bilingual and uses both Spanish and English in the classroom. Two children, Joey and Hailey, have special needs requiring an individual education program (IEP). Joey has significant speech delays and is learning to use an adaptive and augmentative communication (AAC) device. Hailey has cerebral palsy (CP) resulting in significant motor delays, especially on the left side of her body. She uses a wheelchair for mobility. On occasion, some children exhibit challenging behavior during small group lessons. Ms. Jones would like to implement strategies to address challenging behavior in the classroom. Ms. Jones and Ms. Hernández have the children carry small plastic baskets to the playground. They encourage the children to collect natural items that have fallen from the trees. 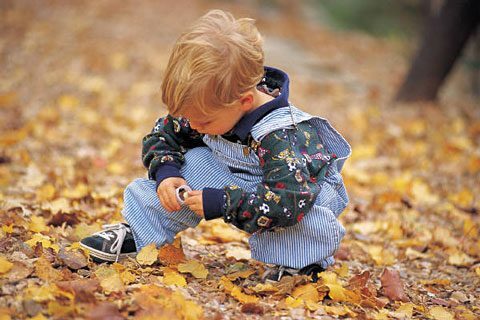 The children collect leaves, nuts, seedpods, pinecones, pine needles, and berries. A few children also collect pebbles and woodchips from the ground. The teachers and children talk about the types of items they are finding. The teachers encourage the children to describe the colors, textures, and scents of the items. The sensory table is empty when the children and teachers return from the playground. The children and teachers place the natural items into the sensory pan. Magnifying glasses are available so the children can take a closer look at their items. The sensory table is available as a choice during playtime for the children to come and explore the natural items throughout the week. The teachers encourage the children to sort and classify the items by various properties as they explore the natural items in the sensory table. For example the children and teachers first sort and classify the items by item type (e.g., leaves, sticks, pine needles), then by color (e.g., green, brown, yellow), and by texture (e.g., smooth, prickly). In addition to the sensory table, a table is set up with markers, glue, tape, and construction paper. The children are encouraged to make a chart that displays the items they have classified in the sensory table. For example, several children make leaf charts and label them “Leaves.” Zip-top bags and tape are available for children to create charts with pinecones and nuts because those items are difficult to attach to paper with glue. The teachers also help the children label their charts with the species names (e.g., maple leaf, oak leaf, pine needle). They encourage the children to look at the posters and activity books to match their leaf to the species of tree displayed in the books and posters. The children are encouraged to try to write a letter, symbol, scribble, or word to label their charts. The teachers maintain an anecdotal record of the children’s activities with the natural materials. They note whether a child was able to identify a property of the materials they wanted to sort out in the sensory table and whether they were able to create a collection to match that property (e.g., things that are green and including green leaves and nuts with green shells). The teachers use digital photographs to document the children’s activities for their portfolios and write short anecdotes about the children’s activities. The teachers also observe and record what type of writing and reading skills the children demonstrate during the nature chart activity. The teachers reflect upon the children’s interest in creating the nature charts. They notice the children were very interested in knowing the names of the types of trees on the playground. The teachers and children take photos of the trees on the playground for the classroom tree album. They make plans to include a nature chart for each tree in the album with samples of leaves, flowers, nuts, seeds, and bark rubbings from each season. 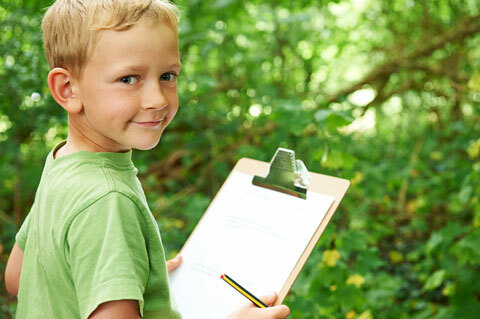 Some of the younger children in the classroom are frustrated that they cannot form letters like the 4- and 5-year-old children can when labeling their nature charts. The teachers praise the younger children’s efforts at scribbling letterlike forms. 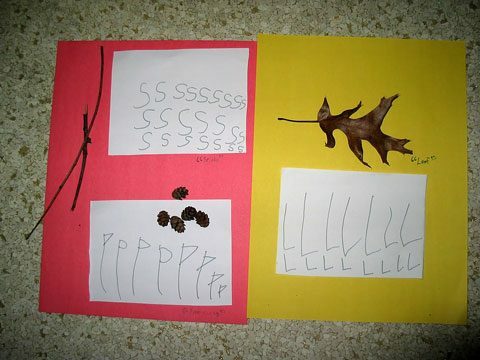 The teachers write down the children’s requested words on their charts (e.g., “brown things” on a collection of brown leaves, nuts, and pine needles). 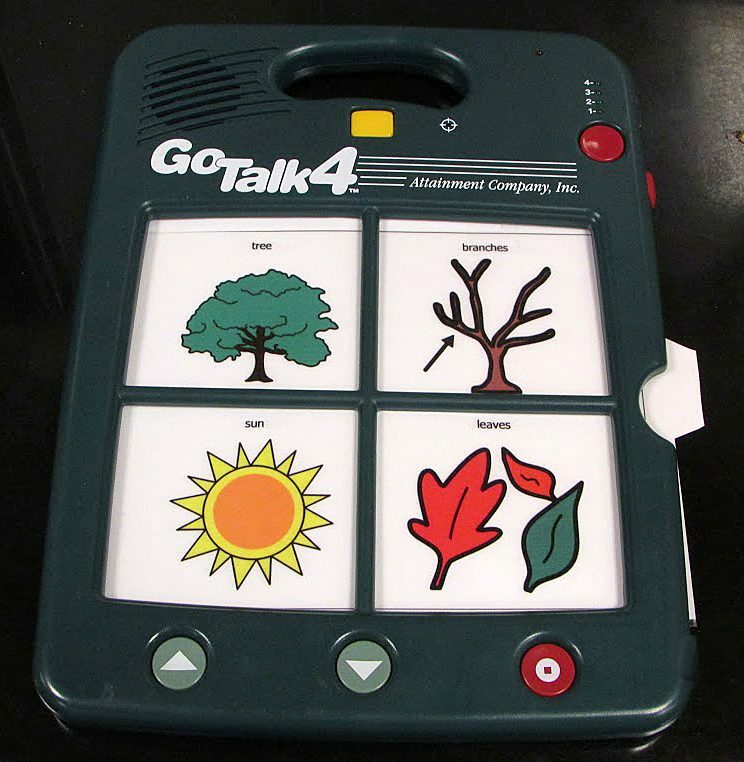 The teachers add some basic vocabulary about natural items found on the playground to an AAC device with pictures (e.g., leaf, pine needle, acorn, pine cone). The teachers encourage the child to use the device to indicate the item he wants to sort from the sensory table. They also encourage him to use a chart of colors and a poster with leaves to point to items and properties he was using to sort items. Teacher: What did you find on the ground? Teacher: Yes, you have three leaves in your hand. Child has cerebral palsy (CP) resulting in significant motor delays, especially on the left side of her body. She uses a wheelchair and walker for mobility. The teachers put the basket for collection in the carrier attached to her walker. Other children bring items to child’s basket. The sensory table and nature chart activities are at tables high enough to let her work in her wheelchair. The teachers use a clipboard to steady her paper so she can apply glue with her right hand and avoid having the paper slide around on the table when using a glue stick. Two of the children become excited at the sensory table and begin to throw leaves in the air. The teacher helps these two children step away from the sensory table for a moment. She reminds them that the sensory table is a place for sorting and redirects their attention to the baskets on the table that are available for sorting. She helps them each choose an attribute of items to use as criteria to sort into a basket. As the children become more engaged in sorting, she praises their appropriate use of materials. She also comments that it is fun to throw leaves in the air outdoors. The children and teachers make a plan to do that during outdoor play. Raúl, Luis, and Esther are dual language learners whose heritage language is Spanish. The teachers continue to introduce relevant Spanish vocabulary (i.e., colors, texture, item names).